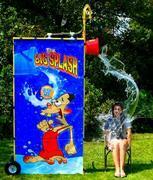 Beat the heat with these cool water games! Put your pitching skills to the test by taking aim, Hit the bull`s eye to dump a bucket of water on your Friends, Parents or Boss! Fun for Everyone. 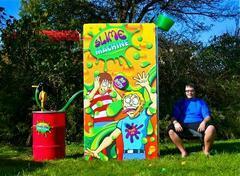 The Slime Machine creates a fun event which is inclusive of all, including seniors, children, larger people, etc. Anyone who can sit under the bucket can participate. Kids go nuts for the Slime! !